We'll ensure a great start to your marriage, the rest is up to you! Boasting over 14 Georgia wedding venues and locations throughout the 1,500-acre resort for both ceremonies and receptions, Lanier Islands is the perfect place to begin your new life together. Whether your vision of an ideal ceremony is in a wooded lakeside hideaway or along beautiful lakeside shores, Lanier Islands offers many options for creating your picture-perfect wedding. Exchange your vows aboard a yacht or overlooking the lake at one of our immaculately decorated wedding locations in Georgia. For your convenience we can provide a comprehensive service that includes wedding specialists, catering managers, an on-site executive catering chef, an extensive list of affiliated florists, photographers, DJs, musicians, and more. 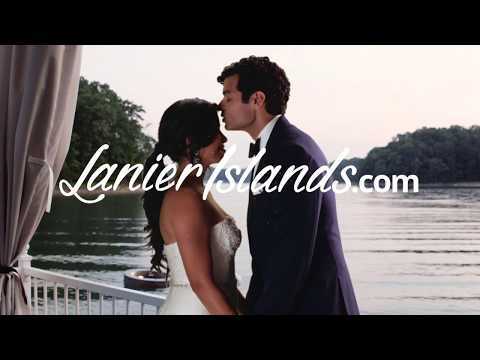 In addition to being the ultimate wedding location in Atlanta, Lanier Islands is also ideal for group accommodations for the wedding party, or for the bride and groom’s Southern style honeymoon, spa services before or after the wedding, and a variety of other recreation options. Make destiny a legacy with Lanier Islands and fall in love all over again. We have many options which include wedding showcases, bridal luncheons, brunches, rehearsal dinners and more. Stunning. Unique. Timeless. See your dreams unveiled at our picturesque lake wedding venues. See wonderful weddings in action. No one has all of life's answers, but we can help you with any wedding question.